1Bloodworks Research Institute, Seattle, WA, USA. 2Department of Nuclear Medicine, Istanbul School of Medicine, Istanbul, Turkey. 3Department of Hematology, Istanbul School of Medicine, Istanbul, Turkey. 4Department of Biostatistics and Epidemiology, Marmara School of Medicine, Istanbul, Turkey. 5Department of Pathology, Istanbul School of Medicine, Istanbul, Turkey. Received: February 14, 2018; Revised: May 16, 2018; Accepted: May 27, 2018; Published online: December 17, 2018. Bone marrow involvement (BMI) affects the lymphoma stage, survival, and treatment. Bone marrow biopsy (BMB) and fluorodeoxyglucose (FDG) positron emission tomography- computed tomography (PET/CT) are useful techniques to detect BMI. Both have advantages and disadvantages. We aimed to identify factors that could be used to predict BMI with positive and negative results on PET/CT compare them with BMB in newly diagnosed patients with lymphoma. We included 22 non-Hodgkin and 16 Hodgkin lymphoma patients in this single center study. All patients had PET/CT examination and BMB before treatment. BMI in BMB was reported as negative or positive. Bone marrow was classified into 3 types by FDG uptake on PT/CT; diffuse involvement, focal involvement, and normal bone marrow. PET/CT and BMB results were concordant (7 positive, 15 negative) in 22 patients (57%). We evaluated concordant and discordant patient characteristics and risk-stratified patients for BMI. Our findings suggest that patients with diffuse FDG uptake on PET/CT, especially patients with advanced age and low platelet and white blood cell counts, are likely to have BMI and could potentially forego BMB. Patients with negative PET/CT findings and no significant laboratory abnormalities are very unlikely to have BMI. Our results suggest that BMI should not be decided solely based PET/CT or BMB findings. It is reasonable to use both diagnostic assays along with clinical and laboratory findings. PET/CT result, clinical and laboratory findings could be useful for predicting BMI in patient for whom BMB is contraindicated. Bone marrow involvement (BMI) affects the lymphoma stage, survival, and treatment models. Bone marrow biopsy (BMB) is a routinely used diagnostic and staging modality, in conjunction with imaging methods in patients with lymphoma. 18F-fluoro-2-deoxy-D-glucose (FDG) positron emission tomography-computed tomography (PET/CT) is an imaging modality that is increasingly used for the initial staging of lymphoma patients, with previous studies showing that it has high sensitivity for early detection of BMI in patients with lymphoma . PET/CT is a non-invasive technique that allows extramedullary disease detection and evaluation of whole-body bone marrow. These advantages make PET/CT a valuable adjunct in the diagnosis of lymphoma, and it has been proposed that it could replace BMB for bone marrow assessment in these patients. In this study we compare PET/CT with BMB for identifying BMI in newly diagnosed patients with non-Hodgkin lymphoma (NHL) and Hodgkin lymphoma (HL). Patients presenting to the Istanbul School of Medicine with a diagnosis of lymphoma who underwent both PET/CT scan and BMB before treatment were included in this study. Patients were staged based on the Ann Arbor staging system and classified according to the World Health Organization (WHO) and Revised European American Lymphoma (REAL) classification systems. Patients' history, physical examination, and laboratory tests were recorded. Patients who had begun treatment for lymphoma or were using bone marrow-stimulant factors or drugs before PET/CT scanning were excluded from this study. Patients with sepsis or active infection during PET/CT scanning were also excluded, as infection can affect the results. For all patients who underwent unilateral iliac crest BMB, their BMB specimens were reviewed by faculty pathologists at the Istanbul School of Medicine. Lymphoma involvement was defined as the presence of abnormal lymphoid cells in the bone marrow and biopsy specimens were classified based on WHO classification. PET/CT imaging was done at the Department of Nuclear Medicine by Biograph 6 HD Truepoint PET/CT (Molecular Imaging, Siemens Medical Solutions Inc., Malvern, PA, USA) 1 hour after intravenous injection of 0.2 mCi/kg 18-FDG. PET acquisition was performed for 4 min per bed position for seven to eight bed positions. Bone marrow was classified into 3 types based on signal intensity and localization by FDG uptake on PT/CT: diffuse involvement (DI), focal involvement (FI), and normal bone marrow as described previously . The evaluators of PET/CT images and BMB were blinded to the results of the other assay. The Ethics Committee of Istanbul School of Medicine approved the study in accordance with the ethical standards of the Helsinki Declaration. Informed consent was not required for this study. The data were analyzed using SPSS 15 software. The results are expressed as mean, standard deviation and percent. Fisher's Chi-square and Pearson Chi-square tests were used for categorical variables. Comparisons of continuous variables were performed using student's t-test for normal distribution and Mann-Whitney U test for non-normal distribution. In all analyses, P<0.05 was considered statistically significant. Data were collected from 38 patients with NHL (N=22) and HL (N=16). The median age was 44 years (range, 18–88) and there were 23 (61%) males and 15 (39%) females. Twelve (58%) out of 38 patients had stage IV disease according to Ann Arbor staging system. Patient disease, clinical, and laboratory characteristics are summarized in Table 1 and Supplementary Table 1. All patients had BMB and PET/CT examinations for initial staging of lymphoma. The study flow chart is presented in Fig. 1. Nine patients (24%) had BMI on BMB. 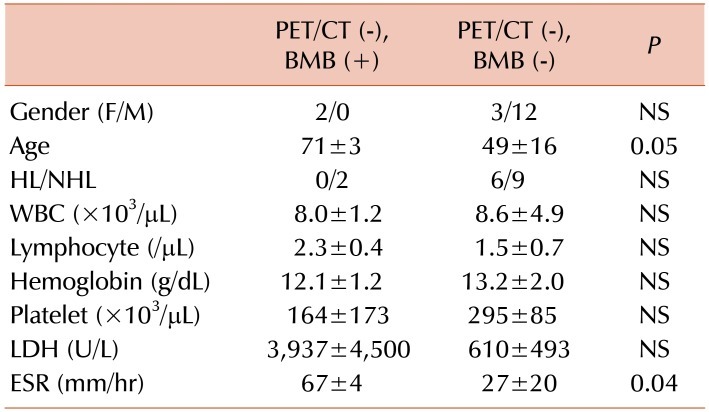 The BMB-positive group was older in age (P=0.007) and had lower platelet counts (P=0.003) than the BMB-negative group (Supplementary Table 2). Twenty-one (55%) patients had BMI on PET/CT. The PET/CT-positive group had lower Hb levels (P=0.001) and higher ESR (P=0.007), than the PET/CT-negative group (Supplementary Table 3). 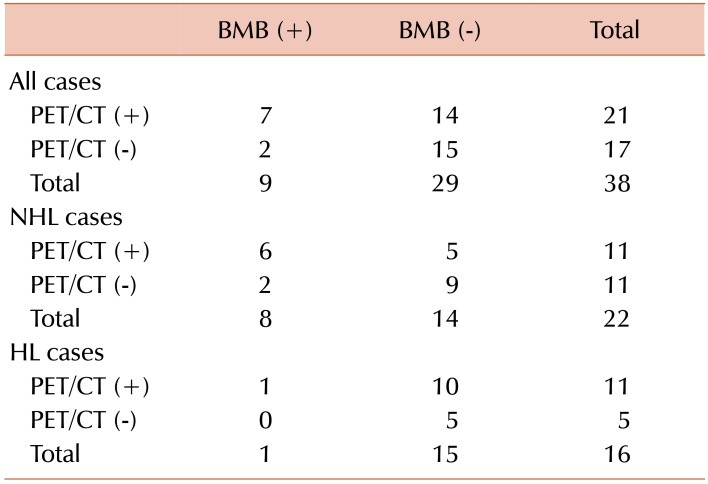 Evaluation of the data shows that the PET/CT and BMB results agreed in 22 (57%) cases, being concordantly negative in 15 (39%) of cases and concordantly positive in 7 (18%) cases (Table 2). Thus, using BMB as the gold standard, the estimated sensitivity of PET/CT was 77%, specificity 51%, negative predictive value (NPV) 88%, and positive predictive value (PPV) was 33%, in all cases. Among NHL cases, PET/CT accurately predicted positive BMI in 6 patients and negative BMI in 9 patients. The PPV and NPV were 57% and 95%, respectively. Among HL cases, PET/CT accurately predicted positive BMI in 1 patient and negative BMI in 5 patients. The PPV and NPV were 90% and 100%, respectively (Table 2). Among the 10 patients with false negative PET/CT results, 7 (70%) presented with a low-grade histological subtype. The remaining 3 (30%) patients presented with DLBCL. Among the 5 patients with false positive PET/CT results, 2 (40%) presented with DLBCL, 1 (20%) with Burkitt's lymphoma, and 2 (40%) with HL. The PET/CT-positive cases were separated into two groups by BMB results. The PET/CT (+), BMB (+) group had significantly lower platelet counts (P=0.005) and higher LDH levels (P=0.048), than the PET/CT (+), BMB (−) group. WBC and lymphocyte counts, Hb levels, and ESR were not different between the two groups (Table 3). The PET/CT-negative cases were also separated into two groups according to biopsy results. The PET/CT (−), BMB (+) group had significantly higher ESR (P=0.04) than the PET/CT (−), BMB (−) group (Table 4). BMI was classified as DI or FI by FDG uptake on PET/CT. Among the patients with positive PET/CT results, 17 patients had DI, and 4 patients had FI. 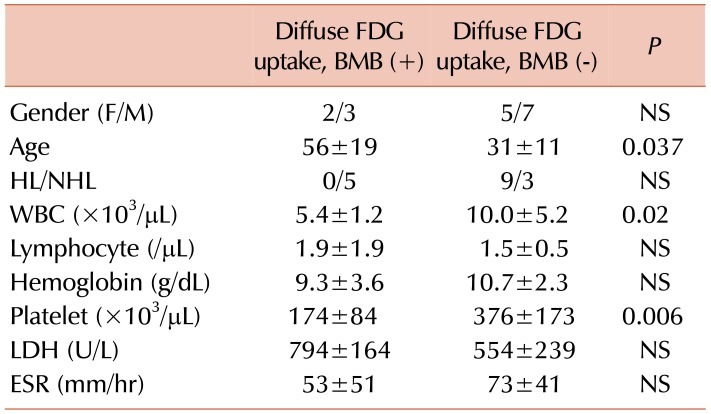 Five of 17 cases with DI were BMB-positive (29%), and 2 of 4 cases with FI were BMB-positive (50%). DI and FI patient Hb levels were both lower than normal range but similar between the two groups. WBC, lymphocyte, and platelet counts, as well as ESR and LDH levels were not different between the two groups (Supplementary Table 4). The cases with DI on PET/CT were separated into BMB-positive and BMB-negative groups. The biopsy-positive group had 5 patients and all cases had NHL. The biopsy-negative group had 12 patients and 9 of them had HL, while 3 had NHL. Among the cases with DI on PET/CT, patients in the biopsy-positive group were older in age than the biopsy-negative group (P=0.037). They also had lower platelet (P=0.006) and WBC counts (P=0.02). Only 1 out of 5 cases had leukopenia (2,950/µL) and NHL. Mean WBC counts were 5,400/µL in the DI-biopsy positive group. Seven out of 12 cases with DI on PET/CT and negative biopsy results had leukocytosis, and 6 of them had HL. Only 1 of them had DLBCL (Table 5). The staging of lymphoma after diagnosis is crucial for treatment and prognosis. Extra-nodal involvement is classified as grade 4 lymphoma and affects prognosis . PET/CT is an imaging method that has high sensitivity and specificity for detecting extra-nodal involvement and for monitoring response to treatment . BMB, which has an important role in the staging of lymphoma, is an invasive method based on the examination of a very small area. In NHL, BMI is seen in 18–36% of aggressive lymphomas and 40–90% of indolent lymphomas . In HL, BMI is detected in 5–14% of cases . BMI was detected by biopsy in 34% of our cases with NHL and 6% in HL cases. BMI was detected by PET/CT in 50% of patients with NHL and 62% of patients with HL. The rate of BMI detected by PET/CT tended to be higher in cases with HL. As a result, BMI rates tended to be higher in PET/CT than in biopsy. In some cases, mostly patients with HL, PET/CT, the bone marrow revealed false positives. FDG PET/CT can show widespread, increased bone marrow activity in the setting of diffuse BMI or peripheral red blood cell destruction, such as in hypersplenism and hemolytic anemia . In our study, lymphoma cases showed diffuse BMI on PET/CT. This involvement may be due to BMI with lymphoma cells as well as anemia. 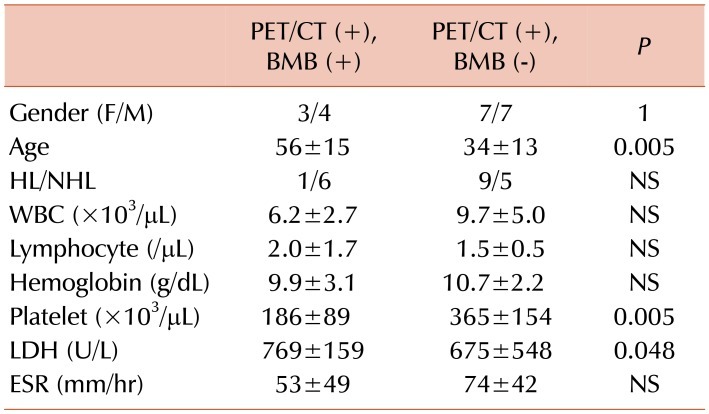 However, cases with diffuse BMI on PET/CT were found to have similar Hb values when divided into groups with and without BMI on biopsy (Table 5). This finding suggests that biopsy may produce a false negative for various reasons, although BMI was sometimes detected on PET/CT but not on biopsy. We did not find any significant difference in Hb levels between the biopsy-positive and -negative groups without PET/CT results, in our study (Supplementary Table 2). Focal BMI was detected on PET/CT in 4 cases, 2 (50%) of which were concordantly positive on biopsy. The rate of focal involvement on biopsy was 50%, which tended to be higher than in patients with diffuse involvement (29%). This finding suggests that diffuse involvement detected in PET/CT is often a false positive in our study patients (Supplementary Table 4). The Hb value tended to be lower in cases with DI compared to those with FI on PET/CT, but both were lower than normal range (Supplementary Table 4). Similarly, low Hb levels were seen in true positive cases with DI compared to the biopsy-negative group (Table 5). The lower Hb levels in the DI group may be due to increased diffuse bone marrow activity associated with anemia, lymphoma infiltration, or other causes of anemia. It is difficult to comment on patients with FI on PET/CT, because the number of patients was low (N=4), and there is little prior data on this topic in the literature. The cases with DI on PET/CT were divided into two groups as biopsy-positive and -negative. Age was significantly higher, and platelet counts were significantly lower in the biopsy-positive group (Table 5). These findings remained consistent when the cases were divided according to biopsy results without considering PET/CT findings (Supplementary Table 2). WBC counts were significantly lower in the group with DI and positive biopsy results. On the other hand, 7 (58%) out of 12 cases with DI on PET/CT and negative biopsy results had leukocytosis (Table 5). Lower WBC count was not thought to be a clinically significant sign of lymphoma infiltration in the biopsy-positive group, as there was a significant difference in WBC counts in the biopsy-positive and -negative groups, but no leukopenia. However, a high WBC count was seen in most patients with DI and negative biopsy results which may be due to bone marrow reactivity. Murata et al. examined the relationship between hematological parameters and FDG uptake values in the bone marrow on PET/CT in 48 patients with solid tumors. They showed that the FDG uptake in bone marrow correlated with WBC and neutrophil counts but not RBC, lymphocyte, or platelet counts . However, this study did not examine BMI by biopsy, and it emphasized the short lifetime of neutrophils, suggesting that it may be associated with endogenous hematopoietic factors . In 24 cases with newly diagnosed HL, El-Galaly et al. found that patients with DI in bone marrow had higher WBC counts compared to patients with FI. They suggested that DI may be related to reactive bone marrow and not lymphoid infiltration . Twenty-three untreated lymphoma patients with DI in the bone marrow on PET/CT had lower Hb levels (91%), higher WBC counts (48%), and lower platelet counts (39%), higher platelet counts (22%) than the normal range . However, this study did not consider biopsy results and did not compare laboratory markers by biopsy results. BMB is not a perfect gold standard and can result in false negatives because of the presence of patchy infiltration in bone marrow and removal of biopsy material from a non-involved site, or because of inadequate amount of biopsy tissue taken. However, in clinical use, BMB is routinely performed and accepted as a gold standard, as there have been no better alternatives. Pakos et al. investigated the role of PET/CT in assessing BMI in lymphoma in a meta-analysis. In this study, a total of 587 patients in 13 studies were examined, and detection of BMI on PET/CT showed a sensitivity and specificity of 74% and 95%, respectively . We detected higher sensitivity and PPV but lower specificity and NPV compared to this previous work . However, the interpretation of our results may be influenced by the limitation that our study had a low number of patients and a mixed patient population (NHL and HL). In addition, the biopsy used as the gold standard was performed unilaterally and could have produced false negative results. In our study, the concordance rate was higher than the discordance rate between PET/CT and BMB. In 50 HL and NHL cases, Carr et al. found a concordance rate of 78%. In our study, the rate of PET/CT (+) and biopsy (−) cases was high. This group of patients mostly had a diffuse uptake pattern on PET/CT and HL. In 24 cases with newly diagnosed HL, El-Galaly et al. found that none of them had BMI in biopsy. Myeloid hyperplasia in bone marrow causes DI on PET/CT, especially in HL cases, which may have caused the high number of these patients in our study . Among the PET/CT (+) patients, the true positive group was significantly older in age, and had lower platelet count and higher LDH levels, than the false positive group (Table 4). These results suggest that hematologic markers could be used to risk-stratify patients with positive PET/CT for true BMI. Among PET/CT (−) patients, the false negative group had a higher ESR than the true negative group (Table 5). These results suggest that patients with negative biopsy and PET/CT results are at very low risk for BMI. Our findings suggest that patients with diffuse FDG uptake on PET/CT, advanced age and low platelet and WBC counts are likely to have BMI and could potentially forego BMB. Similarly, our findings also suggest that patients with negative PET/CT and no significant laboratory abnormalities, are very unlikely to have BMI. Recent publications have shown that a PET/magnetic resonance imaging method is more successful in demonstrating diffuse BMI. This method is not widely available for current clinical use. At present, PET/magnetic resonance imaging has been mainly used in cases where PET/CT has failed . Imaging techniques using advanced technology may progressively reduce the need of BMB for staging lymphoma. This single-center retrospective cohort study describes the test characteristics of PET/CT for the appropriate identification of BMI in lymphoma patients. We also report several factors that could be used to help risk-stratify patients for true positive and true negative PET/CT results. Our findings should ideally be validated prospectively in a larger cohort. However, in conjunction with prior literature, it seems that PET/CT is a useful adjunct to BMB, in the diagnosis of BMI in lymphoma. PET/CT can also potentially be used to investigate BMI in patients who do not want to have BMB or who have conditions, such as obesity or severe osteoporosis, that make it technically difficult for performing BMB. Interpretation of BMB or FDG PET/CT alone may be insufficient to accurately diagnose BMI. Diagnostic strategies should incorporate both modalities, as well as clinical and laboratory findings. Abbreviations: BMB, bone marrow biopsy; BMI, bone marrow involvement; HL, Hodgkin's lymphoma; NHL, non-Hodgkin lymphoma; PET/CT, Positron emission tomography-computed tomography. Patient's clinical and laboratory characteristics. Normal Values: WBC, 4.3–10 K/mL; Hb, 11.5–15.5 mg/dL; platelet, 150–400 K/mL; LDH, 80–190 IU/L; ESR, <20 mm/hr. a)P: Compared only HL and NHL cases. Abbreviations: BMB, bone marrow biopsy; BMI, bone marrow involvement; ESR, erythrocyte sedimentation rate; F, female; HL, Hodgkin's lymphoma; LDH, lactate dehydrogenase; M, male; NHL, non-Hodgkin lymphoma; PET/CT, positron emission tomography-computed tomography; WBC, white blood cells. Detection of bone marrow involvement in lymphoma cases. Abbreviations: BMB, bone marrow biopsy; HL, Hodgkin's lymphoma; NHL, non-Hodgkin lymphoma; PET/CT, positron emission tomography-computed tomography. The comparision of BMI positive cases on PET/CT. Normal Values: WBC, 4.3–10 K/mL; Hb, 11.5–15.5 mg/dL; platelet, 150–400 K/mL; LDH, 80–190 IU/L; ESR, <20 mm/hr. Abbreviations: BMB, bone marrow biopsy; ESR, erythrocyte sedimantation rate; F, female; HL, Hodgkin's lymphoma; LDH, lactate dehydrogenase; M, male; NHL, non-Hodgkin lymphoma; PET/CT, positron emission tomography-computed tomography; WBC, white blood cells. The comparision of BMI negative cases on PET/CT. Abbreviations: BMB, bone marrow biopsy; ESR, erythrocyte sedimentation rate; F, female; HL, Hodgkin's lymphoma; LDH, lactate dehydrogenase; M, male; NHL, non-Hodgkin lymphoma; PET/CT, positron emission tomography-computed tomography; WBC, white blood cells. Comparison of cases with diffuse FDG uptake on bone marrow detected by PET/CT. Normal Values: WBC, 4.3–10 K/mL; Hb, 11.5–15.5 mg/dL; platelet, 150–400 K/mL; LDH, 80–190 IU/L; ESR,<20 mm/hr. Moog F, Bangerter M, Diederichs CG, et al. Extranodal malignant lymphoma: detection with FDG PET versus CT. Radiology 1998;206:475-481. Even-Sapir E. Imaging of malignant bone involvement by morphologic, scintigraphic, and hybrid modalities. J Nucl Med 2005;46:1356-1367. El Karak F, Bou-Orm IR, Ghosn M, et al. PET/CT scanner and bone marrow biopsy in detection of bone marrow involvement in diffuse large B-cell lymphoma. PLoS One 2017;12:e0170299. Solal-Céligny P, Roy P, Colombat P, et al. Follicular lymphoma international prognostic index. Blood 2004;104:1258-1265. Hasenclever D, Diehl V. A prognostic score for advanced Hodgkin's disease. International Prognostic Factors Project on Advanced Hodgkin's Disease. N Engl J Med 1998;339:1506-1514. Federico M, Bellei M, Marcheselli L, et al. Follicular lymphoma international prognostic index 2: a new prognostic index for follicular lymphoma developed by the international follicular lymphoma prognostic factor project. J Clin Oncol 2009;27:4555-4562. Pui CH, Thiel E. Central nervous system disease in hematologic malignancies: historical perspective and practical applications. Semin Oncol 2009;36:S2-S16. Fueger BJ, Yeom K, Czernin J, Sayre JW, Phelps ME, Allen-Auerbach MS. Comparison of CT, PET, and PET/CT for staging of patients with indolent non-Hodgkin's lymphoma. Mol Imaging Biol 2009;11:269-274. Fuertes S, Setoain X, López-Guillermo A, et al. The value of positron emission tomography/computed tomography (PET/CT) in the staging of diffuse large B-cell lymphoma. Med Clin (Barc) 2007;129:688-693. Freudenberg LS, Antoch G, Schütt P, et al. FDG-PET/CT in re-staging of patients with lymphoma. Eur J Nucl Med Mol Imaging 2004;31:325-329. McKenna RW, Bloomfield CD, Brunning RD. Nodular lymphoma: bone marrow and blood manifestations. Cancer 1975;36:428-440. Mckenna RW. In: Dunphy CH. Neoplastic hematopathology. 1st ed. Baltimore, MD: Williams & Wilkins; 1992. p. 1156. Elstrom RL, Tsai DE, Vergilio JA, Downs LH, Alavi A, Schuster SJ. Enhanced marrow [18F]fluorodeoxyglucose uptake related to myeloid hyperplasia in Hodgkin's lymphoma can simulate lymphoma involvement in marrow. Clin Lymphoma 2004;5:62-64. Aflalo-Hazan V, Gutman F, Kerrou K, Montravers F, Grahek D, Talbot JN. Increased FDG uptake by bone marrow in major beta-thalassemia. Clin Nucl Med 2005;30:754-755. Murata Y, Kubota K, Yukihiro M, Ito K, Watanabe H, Shibuya H. Correlations between 18F-FDG uptake by bone marrow and hematological parameters: measurements by PET/CT. Nucl Med Biol 2006;33:999-1004. El-Galaly TC, d'Amore F, Mylam KJ, et al. Routine bone marrow biopsy has little or no therapeutic consequence for positron emission tomography/computed tomography-staged treatment-naive patients with Hodgkin lymphoma. J Clin Oncol 2012;30:4508-4514. Adams HJ, Kwee TC, Fijnheer R, Dubois SV, Nievelstein RA, de Klerk JM. Diffusely increased bone marrow FDG uptake in recently untreated lymphoma: incidence and relevance. Eur J Haematol 2015;95:83-89. Pakos EE, Fotopoulos AD, Ioannidis JP. 18F-FDG PET for evaluation of bone marrow infiltration in staging of lymphoma: a meta-analysis. J Nucl Med 2005;46:958-963. Buchmann I, Reinhardt M, Elsner K, et al. 2-(fluorine-18) fluoro-2-deoxy-D-glucose positron emission tomography in the detection and staging of malignant lymphoma. A bicenter trial. Cancer 2001;91:889-899. Carr R, Barrington SF, Madan B, et al. Detection of lymphoma in bone marrow by whole-body positron emission tomography. Blood 1998;91:3340-3346. Antoch G, Bockisch A. Combined PET/MRI: a new dimension in whole-body oncology imaging?. Eur J Nucl Med Mol Imaging 2009;36:S113-S120. Heacock L, Weissbrot J, Raad R, et al. PET/MRI for the evaluation of patients with lymphoma: initial observations. AJR Am J Roentgenol 2015;204:842-848.